Italy is mired in fresh political turmoil, with the president facing impeachment calls after he vetoed a choice for finance minister. In a rare move, President Sergio Mattarella said he could not appoint the Eurosceptic Paolo Savona, citing concerns by investors. The decision ended a bid by Italy's two populist parties to form a coalition. Mr Mattarella may now appoint a stop-gap prime minster with early elections looking increasingly likely. He has summoned Carlo Cottarelli, a former executive director of the International Monetary Fund, who could form an interim administration. Italy, the eurozone's fourth-biggest economy, has been without a government since elections in March because no political group can form a majority. The Five Star Party had been trying to form a government with another populist party, the right-wing League. The BBC's James Reynolds in Rome says a temporary prime minister is unlikely to last long and early elections may have to be called. There is now a real argument between the president and the populists about Italy's position in the EU, he adds. A political novice, Giuseppe Conte, was proposed by the two populist parties as prime minister in an attempt to break Italy's 11-week political deadlock. He went to meet Mr Mattarella to put forward choices for his cabinet but the president vetoed Mr Savona as finance minister, citing his fierce opposition to membership of the eurozone. Should Europe be scared of Italy's coalition? Justifying his move, he said "uncertainty about our position in the euro has alarmed Italian and foreign investors", and argued that Mr Savona's stance clashed with the two parties' own position on Europe. "I asked for... an authoritative person from the parliamentary majority who is consistent with the government programme... who isn't seen as a supporter of a line that could probably, or even inevitably, provoke Italy's exit from the euro," Mr Mattarella said. He added that Mr Conte had refused to support "any other solution" and then surrendered his mandate to be PM. Under Italian law, the president has the right to reject the appointment of a cabinet member but the power is rarely used. According to the AFP news agency, it has happened at least three times before, including in 1994 when then-President Oscar Luigi Scalfaro blocked attempts by former Prime Minister Silvio Berlusconi to appoint his personal lawyer Cesare Previti as Minister of Justice. The president's role is largely ceremonial but he does have some key powers, such as appointing heads of government and the ability to dissolve parliament. With Italy seeing frequent instability - there have been dozens of governments since 1946 - the president has often stepped in during a crisis. Five Star's leader Luigi Di Maio called for impeachment under article 90 of the constitution, which allows parliament to demand a president step down based on a simple majority vote. If the vote is in favour, the country's constitutional court then decides whether to impeach or not. "I want this institutional crisis to be taken to parliament... and the president tried," Mr Di Maio said. "Why don't we just say that in this country it's pointless that we vote, as the ratings agencies, financial lobbies decide the governments?" he asked in a video on Facebook. League leader Matteo Salvini called for fresh elections. 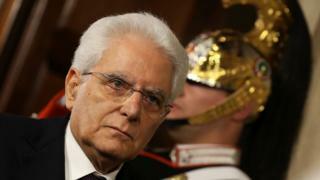 Mr Mattarella said he would wait before deciding whether to call fresh elections, and summoned Mr Cottarelli for talks on Monday. President Mattarella warned on Sunday that the prospect of a populist government had worsened the "spread" - the gap between Italian and German 10-year government bond yields, seen as a key measure of risk. Mr Savona, who served as industry minister during the 1990s, has been an outspoken critic of the EU and an opponent of austerity programmes. That has prompted concern over the proposed coalition's commitment to the EU and its ability to rein in the country's massive national debt - equal to 1.3 times its annual output.